This version gets rid of the flash-forward prologue, which distracted a lot from the rest of the movie up until that point. Some annoying dialogue, the poorly conceived hasty wedding, the Rabbit’s Foot McGuffin and some continuity errors along the way were fixed for an even greater and less annoying movie. 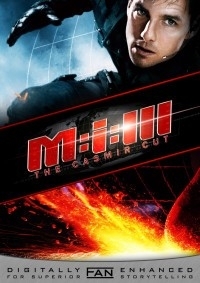 I loved Mission Impossible III, and the movie completely sucked me in when I first viewed it in the theater. Still, I always had a few complaints. First and foremost, the entire idea for this edit was my hatred of the flash-forward prologue. J.J. Abrams decided to show us the entire climatic scene of the movie, as the opening sequence! For me, this distracted me a lot from the rest of the movie up until that point, and removed any suspense about the fate of Ethan’s fiance. After moving the prologue to the climax where it belonged, I trimmed annoying dialogue, removed the poorly conceived hasty wedding, allowed the Rabbit’s Foot McGuffin to be a true McGuffin without stupid guesses from Simon Peg, and fixed up some continuity errors along the way. Mission Impossible III was already a great movie, I simply feel I’ve fixed a bunch of annoyances, and allowed the rest to shine. Doing this often required a lot of finessing the audio at transitions. Including two parts where I had to use music from the soundtrack to extend a song that ended prematurely in the film. Most of the edits I wanted to make weren’t terribly difficult, and a couple of them I found tremendously challenging. This is actually my first ever completed fan-edit, and I’m very proud of it (I finished it before I even started on my 24 editing, just hadn’t gotten all the technical authoring details ironed out until now). Thank you Astonmartins4me for the beautiful cover art! Removed Flash-forward prologue and moved these scenes to the ending where they belonged in the first place. Moved the title, opening credits, and Mission Impossible theme music to after Ethan accepts his mission. Which I makes it feel a lot more like a Mission Impossible movie. Moved the title to the end of the actor credits, instead of hidden within them. This required using the soundtrack to extend the theme music a few seconds, but I think was worth it to highlight the movie’s title properly. Trimmed some of the more over-the-top and annoying parts of the mission debriefing with Brassel giving Ethan and Musgrave the third degree. Now the point still gets across, but he doesn’t come off as just a rude out-of-line boss for the audience to resent. Slight trim during the funeral while Ethan is flashing back to training Lindsey Farris. Cut one of the montage scenes of fighting with sticks. Apparently according to this montage 90% of IMF training is learning to fight one-on-one with sticks. I trimmed what little I could. Cut Luther making a bad joke about Ethan sleeping with his little sister. It just didn’t work. Cut Simon Peg going off on his ridiculous sidebar about the Rabbit’s Foot possibly being the “anti-God.” This doesn’t make sense as a guess, and doesn’t make sense that he would say it at all. Now we can all enjoy a real McGuffin. For me this is the second most important change in my edit (after the removed prologue). Cut the improvised wedding in the Hospital. I really felt that this was uneccessary. Plus, it simply felt false to me. She trusts him, but wants reassurance… so they get married 20 minutes later with plastic rings in her nurse’s scrubs? A very melodramatic scene. This meant a handful of other cuts later in the movie to erase all mentions to them being married. Especially lots of cut dialoge where Luther warned Ethan about the perils of marriage, which I actually didn’t miss at all. Cut most scenes in the Vatican of Luther making the mask of Davian. The special effects for these scenes are very poor. Cut one of Davian’s lines while he was held captive on the plane. A little too over the top when he says “you saw what I did with your friend at the warehouse. That was nothing. That was fun.” Now he’s a little more cool and collected, not just goading his captors uneccessarily. Trimmed a couple seconds of Luther yelling at Ethan to stop threatening Davian in the airplane. Fixed blatant continuity error while Ethan is running through the streets of Shanghai. He stops just short of getting hit by a truck at high speed… then turns around the corner and we see that the “street” the truck came from is a narrow alley blocked with walking pedestrians. Trimmed a couple seconds of Julia performing really fake CPR on Ethan in China. Cut happy ending back at IMF. Too hokey, and didn’t add a single shred of information or value to the movie. Now the film cuts to credits as we fade out on Ethan and Julia in China. Originally the ending credits played the Mission Impossible Theme, following by a boring hip-hop song, and a remix of the theme music. I replaced the latter two songs with my own selections. Flobots – Mayday!! !, and The White Stripes – Hypnotize. I liked MI-3 quite a lot, probably even more than the first one, which had the huge advantage of being the first one though. It’s been 2 years since I last watched it, so this fanedit just came in the right time for me for a kind of fresh start. Judging from the list of changes this is basically a trimmed version. Let’s start right at the beginning. The original has (what obviously some dislike) a flash-forward cliffhanger beginning with a lot of impact. The fanedit starts peacefully at a party. While I understand the idea of the faneditor I find it unfitting for a MI movie to start with anything else but action. In my opinion this new beginning falls very flat in comparison, yet it worked well enough to still be a proper introduction. The moving of the title credits felt wrong to me and appeared to be tacked on. There is no sign that it is a fanedit in the beginning titles. The plot flows well from this point with the exception of an unnatural fade, when the wedding was cut. Everything was executed very well. I want to say a huge “thank you” to Casmir Radon for removing the anti-god thing as the worst part in the movie for me. He is just right. It does not really matter what it is. It’s important and mighty, that is all that counts and this message is well delivered. The movie ended too quickly though. While the faneditor’s version works it is not what a blockbuster MI movie would have been like. The additional scenes with the MIF team would have been good for a proper ending. The end credits are in the beginning self created which clearly shows and then the original credits roll. I did not like the new songs at all and I don’t think they fit to the movie. 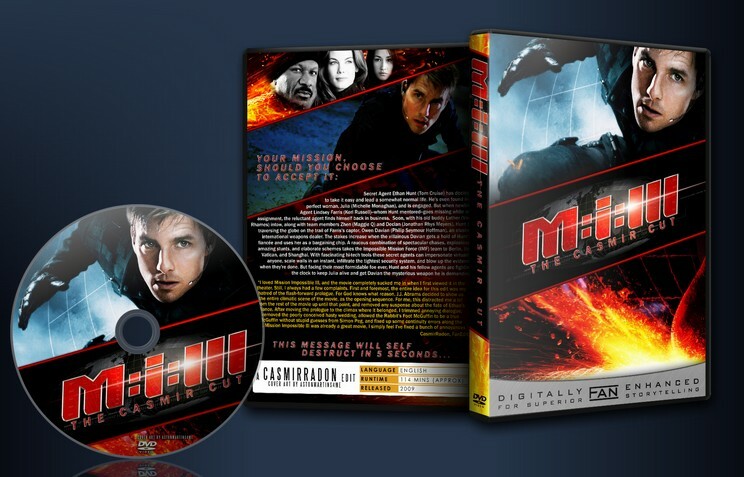 Overall I was entertained by Mission Impossible 3 again. The fanedit is not drastically different. There are some improvements and some parts that I consider a decrement, making in the end the original still my preferred version. Image and video quality were very good. There were no hard cuts. At one point in a dialog the audio was gone for a split second. The DVD comes with nice still menus with sound. There are no chapter menus. 4 deleted scenes and an about menu are the extras, which is nice. Astonmatrins4me’s cover art is great. The beginning title s were not truly altered, the end credits had a bad very obvious self created beginning and then were the original ones. I did not like the new songs. 2 possible improvements: animated menus and good self created end credits with a more fitting song selection.